Travel down under to hang out with all the local creatures in Oz. Click here to play! Relax with a stubby and search these reels for exotic animals for a chance to bring in the big cash wins! There's one phrase that the Australians live by and that's �No Worries'. It's the mantra of this game as well. 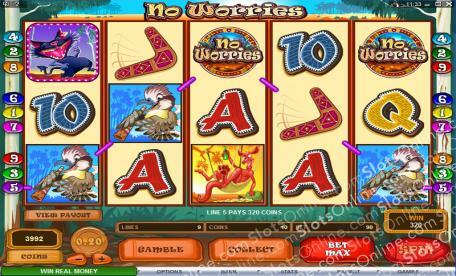 Spin the No Worries symbol across the reels to bring in up to 5000 times your line bet. It will also replace most other symbols to help you create more wins. Keep an eye out for the Wallaby as this hopping creature will bring in up to 2000 times your line bet. There's also the Koala, Platypus, Wombat and Kookaburra that will help you in your down under quest for cash. Plus, you can try to double your winnings by choosing the gamble option. It's a chance to really boost your bankroll! You can't visit Oz without throwing a boomerang or two. These unique flying objects will get you a number of free spins if you find three or more anywhere on the board. You'll also want to keep an eye out for Tazza the Tasmanian Devil. This mischievous little guy is a scatter and will pay out up to 300 times your total bet if you spin three or more anywhere on the board. Become a real Aussie in this fun game and you could be bring in plenty of cold hard cash. Tazza the tazzy devil is a scatter. Spin him three or more times anywhere on the board to multiply your total bet by 3, 30, or 300. The boomerang is also a scatter symbol. If you can spin five of them from left to right, you will trigger the free spin feature in which prizes are doubled. During free spins, if a beer can appears on the last reel, you will get an extra 1x multiplier. If, at the end of your free spins, you're not happy with your total prize you can opt to re spin the free spins or reveal a mystery prize. The No Worries symbol is a substitute. It will substitute for all of the animal symbols (except Tazza) to help you create more winning combinations. It will also double prizes when it appears in a winning line.